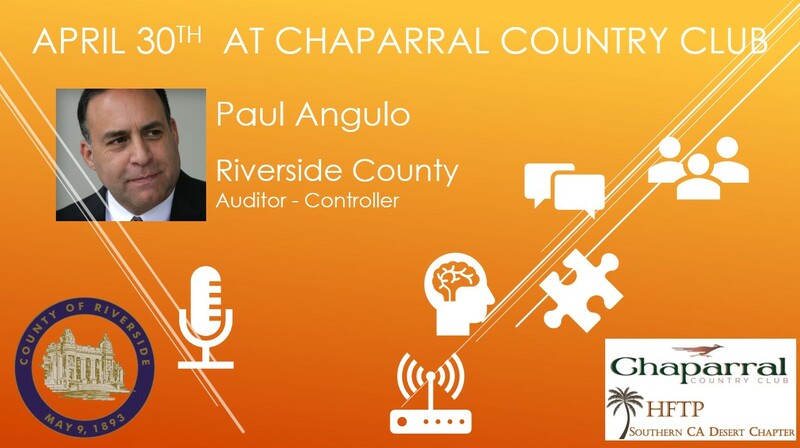 Paul Angulo is Riverside County’s Auditor-Controller. For this meeting, Paul will be discussing fiscal responsibility within the county, with the topic of “Saving your tax dollars. Stopping the bleeding in Riverside County”. Paul is a native of San Francisco, growing up on the now famed 18th Street in the heart of the Castro District. He has fond memories of the Castro and Mission Dolores Park where he played on its rolling hills as a kid. As a teenager Paul’s family moved to southern California. His family moved often during those years resulting in Paul attending fourteen schools before graduating from high school. On high school graduation Paul enlisted in the US Army in 1971 during the very unpopular Vietnam War. As American Forces drew-down in the war, Paul was posted to Frankfurt West Germany under Headquarters US Army V-Corps. His active duty spanned 1971-74 and 1974-1977 inactive Reserves US Army. Paul is honored to have been trained-by and served with incredible men and women returning from the battlefields of Indo-China. After receiving an Honorable Discharge, Paul attended U.C. Berkeley graduating with a bachelor’s degree in Political Science. Following Cal Berkeley Paul spent 25-years working in the manufacturing industry. He also holds a Master’s Degree in Management from the University of Redlands, in addition to other academic achievements. Paul was elected Auditor-Controller in 2010. He was re-elected in 2014 and 2018. He loves spending time with his 15-year old son, training in judo and jiu-jitsu, and riding his Harley-Davidson Fat-Boy motorcycle. We will see you at Chaparral Country Club!